This series is focused on one key way that INCOME can be increased and that is to Negotiate A Pay Raise. In each part, I will be sharing how I have successfully negotiated pay raises in the past. I hope this series helps you do the same! Part 4 – "Receive The Response"
There WILL be a response. It may not be the one you expected. It may be way more than you expected (it happens! ), or it may be way less than you expected (this happens too!). Either way, there will be a response. This is a negotiation. SILENCE makes people uncomfortable. If a manager knows that their response is less than reasonable, silence will allow them to rethink their position. Many times, the manager has been provided some leeway in this discussion, and they have been authorized to adjust the numbers some to ensure an adequate and final response is obtained. SILENCE has been my friend twice. Both times, it resulted in a substantial increase beyond the initial offer. Once the offer has been extended and appropriate silence has occurred, thank them and tell them that you will need twenty-four hours to review the offer (if it makes sense). 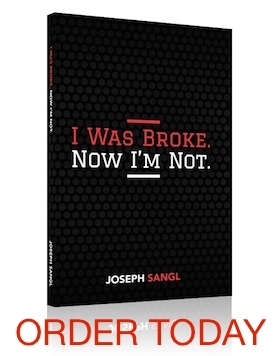 This is Part 4 of a series featured at JosephSangl.com – "Negotiate A Pay Raise"
I share my journey to achieve financial freedom and teach personal finance tools in my book, I Was Broke. Now I'm Not. Check it out!